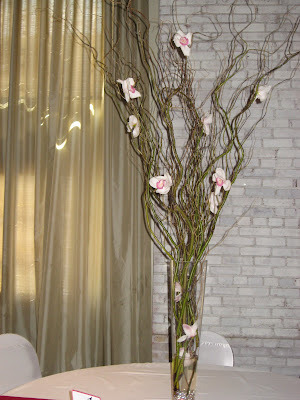 Here is a great example of tall, showy centerpieces using a more “natural” look. Nicole & Ryan were married this past July and had their reception at the Westin. Nicole picked bouquet flowers with a bright, tropical feel. 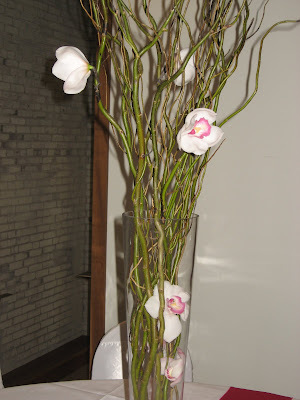 The centerpieces we created showcased the feature flower used throughout the wedding: the cymbidium orchid. 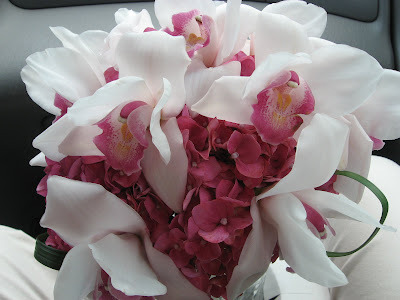 The bride’s bouquet had a base of bright pink hydrangeas accented by white cymbidium orchids with dark pink throats. Loops of lily grass brought another tropical element into the bouquet. The centerpieces were tall trumpet vases filled with curly willow. 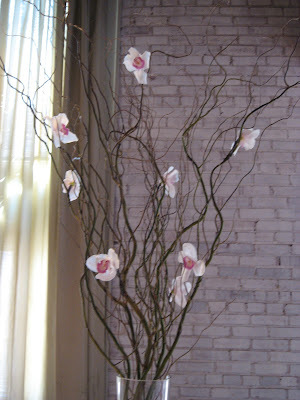 The same white orchids used in Nicole’s bouquet were submerged inside the vase and placed on the tall branched of the willow. Pink LEDs and clear rocks helped to bring out the pink accent color of the reception. Although orchids can sometimes get price-y, we used one stem of orchids broken up on the willow branches to give more “bang for the buck” . 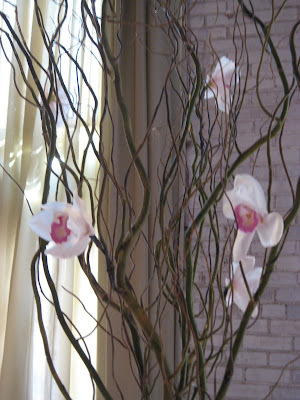 The gorgeous outstretching branches with orchids really brought an element of nature inside the reception room. 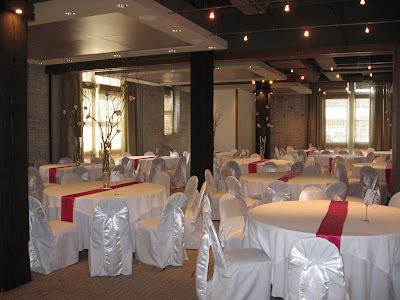 Special thanks to Rebecca Boillat at St. Louis Wedding Design for helping coordinate and design such a beautiful event. And, as always, we wish all our best to the newly married couple! !